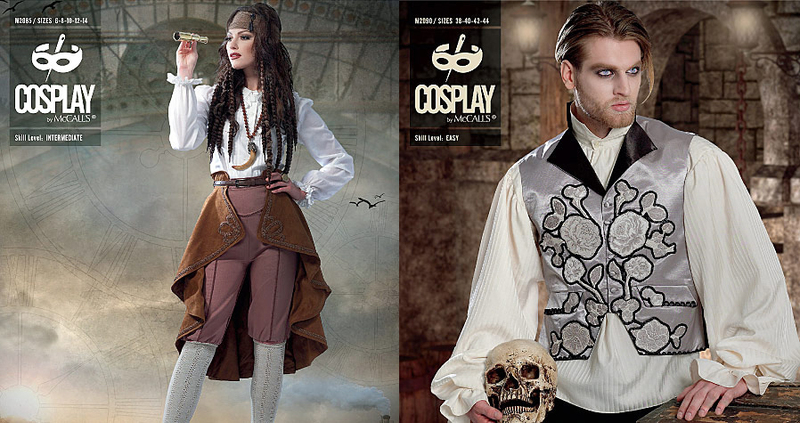 Cosplay by McCalls “Wayfaress” M2085 and “Thirst” M2090 are available on the Cosplay by McCalls website. As usual with this line, they are fun and expressive patterns that are exceptionally adaptable. “Wayfaress” is the most adorable pant/knickers/knee breeches you will ever see coming out of ANY pattern company. 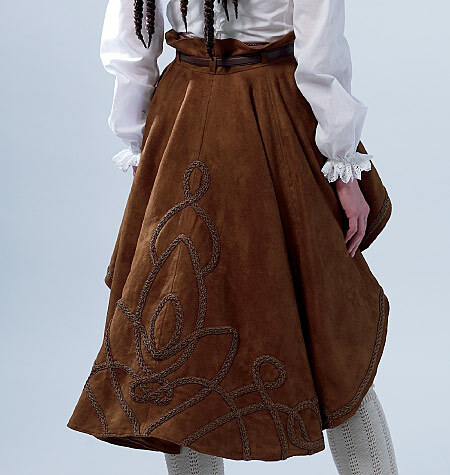 An “intermediate” skill level pattern, it has several options with and without ruffles, laces and cording. It also comes with a beautifully shaped detachable overskirt. 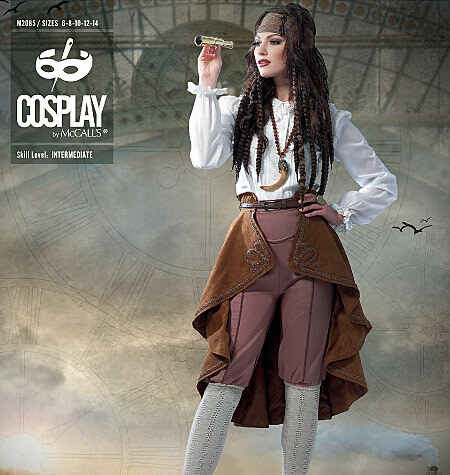 There are the usual Cosplay by McCalls’ choice of 2 pattern envelopes for this pattern: Sizes 6-14 and 14-22. Your envelope tutorial helps you decode ribbon type names and what they look like as well as providing tips on managing perfect topstitching. Let’s get trimming! There are two options for ruffles at the knee, an option for a hip ruffle, or an option for just plain smart knee breeches. All have a flattering front and back yoke that sits just below the natural waist. The plain option adds a waistband to the yoke to bring it up to the natural waist. The center back zipper closure could easily be adapted to laces if one wished. These will work up well in many different fabrics, making these the personality-quick-change champions of patterns. Make them up in Ultrasuede for Anne Bonny pirate breeches, or in chintz for Tinkerbell’s frilly gardening outfit. Do not forget that overskirt. 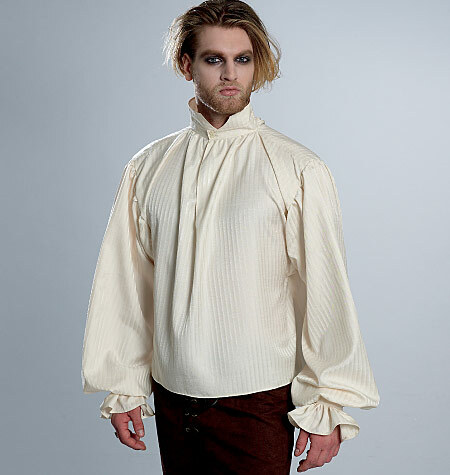 It has a gorgeous shape and could be made out of a transparent fabric so as to show off all the trim and ruffles on the breeches, or it could be a place to display some killer surface design. Its manageable size allows for applique, soutache, beading, EL wire—you name it—to work up well on this skirt, having great impact without breaking the bank in time and supplies. Bang for buck is always good. It’s even better when the base garment is not shapeless. The other pattern in this release, “Thirst,” contains a vest with a lot of options that will make it a staple in your pattern collection. Two size envelopes, 38-44 and 46-52, are available. 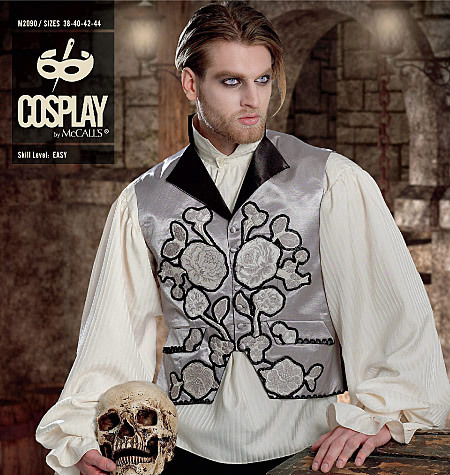 An “easy” skill level pattern, it has a waist seam front and back, allowing you not only to easily play with center back length, but also to play with shapes other than the usual basic vest shape. It offers two collar types: a shawl and a notched version (Which is actually a stand collar in back, and revere in front—not the basic prom/wedding notched collar). 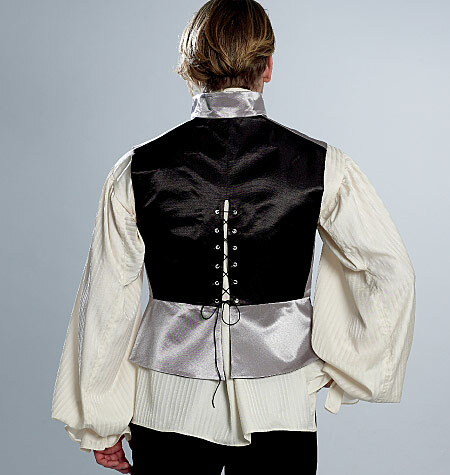 The vest also laces up the back, allowing for some leeway in fit, which is always a good thing. It’s a nice “period” touch as well. Since this is marketed with the idea of embellishments in mind, your pattern tutorials guide you through actual useful appliqué techniques that cover more than “put it down and stitch it”. You will find tips on how to manage the design and placement process as well. The pictures on the envelope make it look like the waist seam is very high—well above the waist, which did not appeal to me. 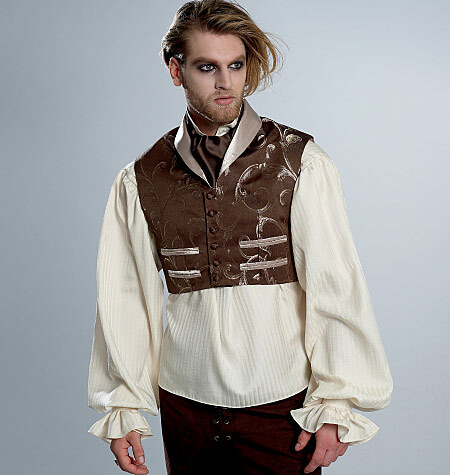 Nor could I find a waist seam that high in a quick search of similar historic vests. Since the shirt also looks short, it seems like this is an artifact of having a very tall model. I was concerned, so I pinned the vest pattern pieces on my own 5’ 9” model, and found the pattern waist to be at my model’s natural waist, right where it ought to be. (This means the real actual waist, not the high hip, where today’s pants are worn). All the same, be sure to check that this seam is where you want it to be before you cut. It’s an easy adjustment, and in fact I am willing to bet that the seam is there—both front and back—to allow for painless pattern alterations. The wonderfully serviceable period shirt in this envelope happily does not use elastic. It has actual cuffs, a neck band, collar, and (YEAH!) underarm sleeve gussets. With the typical slit front and button at the collar, this is a shirt that you will make over and over again for both men and women. Make it up in silk organza and float away in an ethereal dream. Lengthen it to floor length for a dreamy night shirt.